Jean, Suzanne, Bryony, Ellie and Min met at the Wellcome Collection in London on Monday to discuss the possibility of an exciting project involving colour tents, art, science and film in relation to Aquinoe. Suzanne is a recognised expert in colour tents, which can be used as a way of cutting out extraneous sights and sounds, allowing the person inside to focus on one thing. With repetition (sometimes a great deal!) the person’s brain can develop in new ways. Some children with cerebral visual impairment who were, in effect, treated as being blind, can use the tents to develop some sight By stimulating the visual pathways to the brain. Other basic skills may then be taught as well. As well as providing stimulation, the tents can also be used as a calming therapy, so children who are stressed or agitated, can find solace. Under Suzanne’s guidance, Jean and Min took tent equipment to Aquinoe in February 2018. Min is an old friend, who Jean was introduced to in Zambia in 1971. It was her friendship with Bryony that started the seeds of this art/science collaborative project, which hopefully will involve both staff and pupils at Aquinoe (and maybe members of the local community, including parents too). Ellie is a documentary film-maker and conservationist, who has collaborated with Bryony before. She has worked in many locations in a variety of fields. 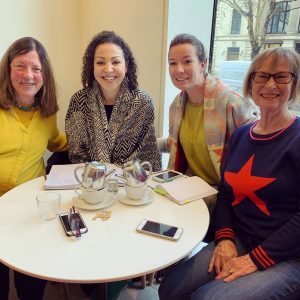 The trustees of the Aquinoe Learning Centre are honoured that these two dynamic women are looking at ways of attracting funds to allow them to go to Aquinoe to carry out their project.